One of the most precious natures' gift to mankind is said to be coffee and especially the one grown in the altitudes of Coorg. Though the origin is not known it is believed to be originated in India amidst the Chandagiri Hills of Chikmagalur district. The coffee from Coorg is supposed to be worlds best mild coffee for it is grown in the shade. The Coorg coffee is noted for its splendid beverages, arousing one's curiosity or interest elusively and stimulating intensity. Not only Coorg almost all the areas where coffee is grown in India is grown only in shade which results in the coffee being not too acidic and carries a tropical full bodied taste and excellent aroma. The history of coffee in India is nearly four hundred years old and it belongs to the 17th century. The heritage of coffee came to India by a traveler named Baba Budan who took a pilgrim to holy places of Islam. -On his return he brought seven magical beans from a country known Yemen situated along the Arabian Coast of the Red Sea. He then planted these seeds in the Chandragiri hills of Karnataka. Coffee then flourished in this area filling the entire environment with fragrance. There are mentions about coffee being drunk by the aristocrats of the Mughal period but nobody can guarantee whether it originated from Malnad farmers or its source lay elsewhere in Ethiopia or Yemen. It can even be the Arab dhows who were operating between the Red Sea and India's western coast. Coffee, when in blossom, fills the air with a compelling fragrance and when it ripens into fruit, a glorious blend of color to behold. This started the mystical beginning of coffee in the country. There is a local saying which states that a planter of Coorg coffee not only puts his hard work but also his entire life into the growing of the crop and literally takes care like caring for his or her own child. No wonder India has continuously produced and was leading in the export market of high quality graded coffee for nearly a century and a half. 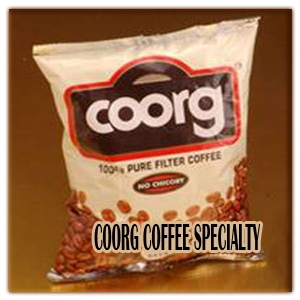 Coorg produces two main varieties of coffee beans namely Arabica and Robusta which are mainly grown for consumption. Coorg is also the leading producer of coffee in the country. But however the most significant period in the history of Coffee is during the 19th century with an extraordinary bursting energy. Maybe, for 150 years or so, coffee was obviously grown by Malnad peasants as a homestead crop in their backyard for their own pleasure and enjoyment.Though initially they grew coffee for their own benefit, slowly the coffee planters got into the concept of exporting coffee to distant countries. It was with the arrival of Jolly, in the service of the famed trading house of Perry and Company of Madras to the Durbar of Mysore to lease out nearly 40 acres of Royal Coffee gardens brought a significant change in the history of Indian coffee. With Jolly there were many other pioneers who were the heroes of Indian coffee. -Coorg is most popularly nick- named as the 'Coffee Cup of India'. The mountainous area of Coorg is strongly reminiscent with the blend of the aroma of fine Arabica and Robusta and they are supposed to be the world's best coffee. The mainland of Indian coffee is distinguished for its featured monsoon-fed coffee which is mostly grown in the shades of huge Rose Wood, Wild Fig and Jack Fruit trees. The place is not only ideal for coffee but also promotes distinct eco-system for it is the home for great birds and animals like the Great Indian Pied Hornbill and the Giant Malabar Squirrel which are attracted by the fruit laden trees with rare flavors and aroma. The month of February is loaded with the aroma of snow white coffee blossoms, indicating the beginning of the coffee season and by the end of November we can get to see the great sight of ripe red coffee cherries. It was in the year 1854 the first coffee estate was established in Coorg by an Englishman, named John Fowler. Then Captain Le Hardy, the first British Superintendent took a lot of interest in the welfare of the growing of coffee and soon nearly every family in Coorg had started growing the brew that refreshed the world. Now the estimated amount of coffee produced in Karnataka is about 140,000 tons of coffee a year and thereby being the leading producer of coffee in India. While coffee was the cup that cheered, the hills of Coorg were also the supply depot for the famous spice coast of Malabar. It also promotes intercropping like Pepper, Cloves, Cardamom, Kokum (Garcinia cambogia) and Cinchona paving way for a spice country. Coffee generated a lot of revenue for the state and of course the planters who owned coffee estates. 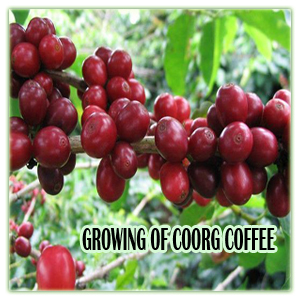 Coorg is one of the historical area of coffee production. It is not easy to grow a coffee tree for it requires lot of perfection and accuracy which is mandatory to grow coffee in shade which involves nearly 50 different types of trees.These shade- giving trees are mainly grown to avoid soil erosion on a sloping terrain and also to enhance the soil by recycling nutrients from deeper layers, protect the coffee plant from seasonal fluctuations in temperature, and play host to diverse flora and fauna. Good quality of coffee can be obtained only by continuous weeding. Coorg is said to have the richest agro- forestry system across the globe with nearly 270 species of shaded trees listed. But however the latest trend is that these native plants and trees are substituted by exotic ones such as the Grevillea robusta. Coorg cultivates all of its coffee under a well-defined two-tier mixed shade canopy, comprising evergreen leguminous trees. Coorg coffee encourages other cultivations like pepper, cardamom, vanilla, orange and banana. The high altitude of Coorg is very prevalent for growing the most wanted variety, Arabica which results in a mild quality of aroma and taste whereas Robusta is grown in warm humid conditions. -The first main aspect required in the growing of coffee is the altitude which should range between 3,300 ft to 4,900 ft above sea level for Arabica (premier coffee), and 1,600 ft to 3,300 ft for Robusta. Both the varieties require a slightly acidic soil with a pH of 6.0–6.5. The rainfall required for coffee growing is in the range of 60–80 inches followed by a dry spell of 2–3 months which suit the Arabica variety. The ideal temperature required for coffee is 73 °F (23 °C) and 82 °F (28 °C). Anyhow very cold temperatures do not do good to coffee. When there is a less rainfall which falls below 40 inches then irrigation is a must requirement. In the tropical region of the south Indian hills, these conditions prevail leading to coffee plantations flourishing in large numbers. The humidity required or preferable for Arabica is in the range of 70–80% and for Robusta it should range between 80–90%. After proper irrigation the coffee plant is said to bloom carrying white flowers which stays for nearly 3 to 4 days which is known as the "evanescent" period. It is a beautiful eye catching sight to view the full bloomed coffee pant.The "evanescent" period is the stage before they mature into seeds. The time period varies for both the varieties of Arabica and Robusta. -It is extended by another two months and thereby totally nine months. When the fruit is fully ripened it is collected or picked by hand during which it will be either in red or purple colour. The planters should be very careful about the various diseases which a coffee tree is prone. Fungus growth which is the disease known as the coffee rot, causes severe damages during the rainy season. The coffee rot which is given the name as Pellicularia kole-rota is also a common disease among the plantations especially in the rainy season. This causes the coffee leaves and the cluster of coffee berries to drop off to the ground. 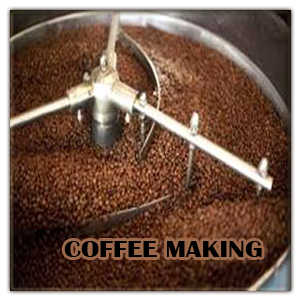 -Processing of coffee is done by two methods, dry processing and wet processing. The traditional method is the dry processing in which the coffee beans are sun dried which is very favorable for a great aroma in its feature. Whereas in the wet processing, various steps like fomenting and washing is required resulting in an improved yield. As to the wet processing, the beans are subject to cleaning to segregate defective seeds. Once processing is done the coffee beans of different varieties and sizes are blended to arrive at its best aroma and taste. The next procedure is to roast either through roasters or individual roasters. Then the roasted coffee is ground to appropriate sizes. - Initially till 1940, the growing of coffee was not really a big challenge for the growers did not look forward for any aid from the government or a favorable price to be fixed at other people’s expense. Coffee was freely exported to other countries. But however today coffee is not really fairing well for the growers and the workers employed in this area.Major portion of the coffee holdings in Coorg are by small growers and there are lot of problems related to marketing and trading. These issues has to be seriously considered as coffee assumes importance due to its export potential as well as the livelihood dependency of large number of small growers which accounts for nearly 98% of holdings. Global coffee market is characterized by big spanking of roasters and exporters at the upper end of the value chain which has very badly affected the primary producers with very little or no incentive at all for productive enhancement, upheaval and for taking part in the niche market. The production was not maintained properly because of high labor costs. Thus, strengthening coffee farmers’ income requires support from the government and private sector like coming up with coffee certification, multi-sectoral partnerships for sustainable coffee value chains which has to gain confidence of small growers in India. 1. Coorg Coffee, No.135, Dvg Rd, Basavanagudi, Bangalore - 560004, Ph: (080) 22427508. 2. Grower Consumer Links, Madekeri, Coorg - 571234, Ph: (08276) 4247717.